← Frozen Green Smoothie Packs – take some hassle out of busy mornings! 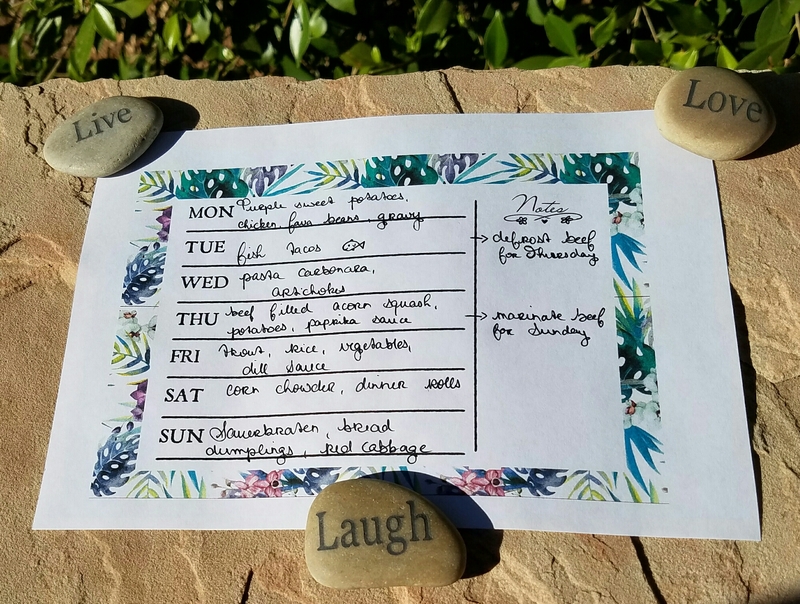 Our first week of planning our dinners went perfectly! How could we survive without? So of course after this success I planned next week’s meals too, again making sure I use primarily what we already have, plan a big portion of vegetables for every day and aiming for a balance of proteins. Monday: We will have purple sweet potatoes with chicken, gravy, and fava beans as our vegetable. I wanted the potatoes as I never had purple sweet potatoes, and the fava beans were on sale at Sprouts. The chicken is already waiting in the freezer! Wednesday: A meal I am very much looking forward to: pasta carbonara and artichokes! We’ll make the pasta from scratch and have fresh artichokes with it that were also on sale at Sprouts. We never had fresh artichokes, so we’re very excited! Thursday: I found a very tasty looking recipe in one of my antique cookbooks, acorn squash filled with ground beef and peppers. I thought a sauce made with bell peppers and Hungarian paprika will compliment it nicely! The side dish will be potatoes. Friday: From my Chopped Challenge we still have a nice piece of steelhead trout in the freezer, which, along with rice, frozen mixed vegetables and dill sauce, will make our dinner for Friday! Saturday: I found a lot of amazing recipes in my new antique cookbooks, two of them will make our dinner on Saturday: Prairie corn chowder and dinner rolls from scratch! Sunday: A German traditional recipe and probably my favorite German meat dish, Sauerbraten! I’ll make bread dumplings with leftover dinner rolls from Saturday and red cabbage to use up a red cabbage head that is waiting for its time to be cooked for a while now. My “Notes” remind me to take the beef out of the freezer in time and marinate the beef brisket for the Sauerbraten. If you want to make your own meal plan, you can find the printable plan here. This entry was posted in Frugality. Bookmark the permalink.